A Cape Cod Community in Denton CO.
Providence Village is a master planned North Dallas suburb featuring homes in Cape Cod and Craftsman-style architecture. 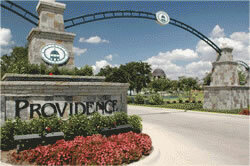 Providence Village homes range in age from 2004 construction to new homes with prices between $100,000 to $200,000. The Village offers outstanding amenities including a clubhouse, community pool, parks, playgrounds, several catch and release stocked lakes, and tennis facilities. Nearby Lake Lewisville has boating, fishing, and other watersports. Providence Village is served two highly regarded school districts: Denton ISD and Aubrey ISD. Providence Village offers a great lifestyle for the entire family, has great amenities, is well located on Hwy 380 between Frisco and Denton, and the price is right. See the latest homes for sale below and call me for a tour or more information. Listing courtesy of New Home DFW. Listing courtesy of Gallery Realtors.